TUCKER WAS ADOPTED AUGUST 18, 2003! Toby and Tucker (brothers) and Samantha (unrelated) were born to feral mothers at an oil company. The employees befriended the kittens and would share their lunch with them in addition to leaving cat food out for them daily. Indeed, the kittens are all very well-fed and plump. The son of the president and co-founder of Companion Critters was working at the oil company for the summer during college break. Every day he would mention how sweet these kitten were and how he would interact with them while on break. And this is how his first solo kitten rescue came to be. One day the kittens were all treated with Advantage and the next day they were placed in carriers and brought home. They were immediately treated to the complete makeover package - nail trim, deworming, bath and ear cleaning. What a difference! They are all soft and fluffy and smell great. 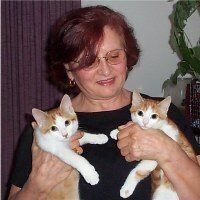 The kittens are all very affectionate and friendly. We hope they get homes soon because the foster home is overcrowded with cats and once they recover from spay and neuter surgeries, we may have to consider releasing them back at the oil company. But that would be a shame because they are not at all feral and would make great house cats where they can live safe and long lives.